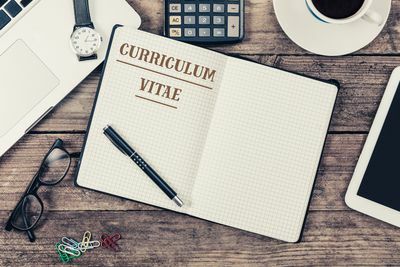 A curriculum vitae, commonly referred to as CV, is a longer (two or more pages), more detailed synopsis than a resume. Your CV should be clear, concise, complete, and up-to-date with current employment and educational information. The following are examples of information that can be included in your curriculum vitae. The elements that you include will depend on what you are applying for, so be sure to incorporate the most relevant information to support your candidacy in your CV. Personal details and contact information. Most CVs start with contact information and personal data but take care to avoid superfluous details, such as religious affiliation, children’s names and so on. Education and qualifications. Take care to include the names of institutions and dates attended in reverse order; Ph.D., Masters, Undergraduate. Work experience/employment history. The most widely accepted style of employment record is the chronological curriculum vitae. Your career history is presented in reverse date order starting with most recent. Achievements and responsibilities are listed for each role. More emphasis/information should be put on more recent jobs. What Not to Include In Your CV?? There is no need to include your photo, your salary history, the reason you left your previous position, or references in your CV. References should be listed separately and given to employers upon request. A good curriculum vitae should ideally cover no more than two pages and never more than three. Aim to ensure the content is clear, structured, concise and relevant. Using bullet points rather than full sentences can help minimize word usage.